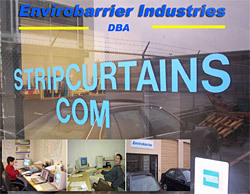 Strip-curtains.com, a fully owned subsidiary of Panamerica Trade, is the premier distributor of roll stock and manufacturer of custom Strip curtains. Strip curtains.com manufactures strip curtains from individual strips of Polyvinyl Chloride (PVC) custom fitted to doorway sizes. 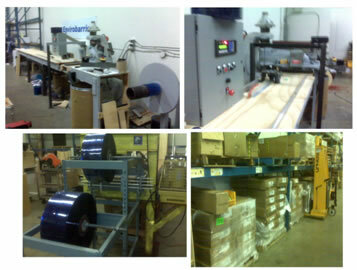 They provide the installation value of a door, while allowing easy access of personnel and equipment. Their primary uses are in temperature control applications such as freezers, coolers, air-conditioned areas, as well as in shipping and receiving doors. Their purpose is to eliminate the escape of cold air and reduce the amount of temperature shared between the different environments reducing utility bills (hydro), increasing employee comfort, and decreasing maintenance costs. End users include refrigeration dealers, food brokers and distributors, cold storage warehouses, fish plants, grocery stores and much more. 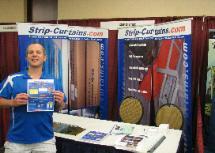 To date, Strip-Curtains.com has installed over 2000 curtain doors and thus Has first hand knowledge of all mounting methods and materials to recommend. With overseas suppliers through its parent company and low overhead, Strip-Curtains.com offers great value at unmatched prices in the Industry. Suite 75 - 1574 Gulf Rd.